Eleven years ago, Susan Shin Angulo was sitting at home taking care of her newborn daughter, Sophie. Outside, a trash truck was collecting garbage just as it did every week in Angulo’s Charleston Riding neighborhood. Five years later, Angulo was elected to Cherry Hill Council, becoming the first Korean-American woman in New Jersey to be elected to public office. Now, Angulo is preparing to embark on a new journey. After six years of serving on Cherry Hill Township Council, Angulo will step down at the end of the year as she prepares to be sworn in to her new seat on the Camden County Board of Chosen Freeholders. Angulo was elected as a freeholder in November. She will take over the seat previously held by Michelle Gentek-Mayer, who was elected as Camden County surrogate in November. Angulo, a mother of two and a 17-year resident of Cherry Hill, is known for her bright smile and infectious enthusiasm during council meetings. 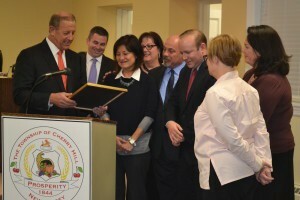 During a ceremony honoring her at council’s Dec. 14 meeting, council members talked of how Angulo’s positive energy and enthusiasm made her the perfect person to represent Cherry Hill. “Throughout her term as a councilwoman, Susan has been a dedicated public servant and an advocate of Cherry Hill residents of all ages and all walks of life,” said council president David Fleisher, who ran alongside Angulo in the 2009 and 2013 township council elections. Angulo attributed her enthusiasm to the amount of pride residents have in Cherry Hill. When Angulo first ran for council in 2009, she talked about countless numbers of people who helped her during the campaign. She couldn’t single out just one person who helped her most. Collecting information is something Angulo has done throughout her tenure on council. She especially enjoyed meeting residents at events and hearing about their ideas on making the township a better place to live. Her enthusiasm for meeting residents spread to a wider audience when she campaigned for her freeholder seat this summer and fall. Angulo enjoyed meeting residents in many of the other towns in Camden County. For Angulo, the time since being elected freeholder has been bittersweet. She is excited for her new position as a county freeholder, but sad she will be leaving Cherry Hill Council. Fleisher said he is confident Angulo will bring her enthusiasm for service to the freeholder board in 2016. “We know she will represent the people of Cherry Hill very well,” he said. Angulo said she will continue to be a presence around Cherry Hill and is looking forward to working with township officials in the future.